Gone Baby Gone proves that Ben Affleck is more effective behind the camera than in front of it. Considering this is perhaps his first movie directorial since his Indy roots, he does a fantastic job of putting the whole story together. 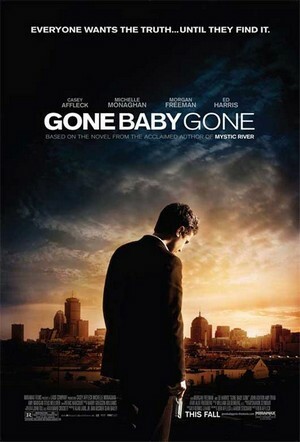 Gone Baby Gone is the adaption of the novel (of the same name) by crime writer Dennis Lehane. It’s basically two missing persons detectives looking for a missing kid in suburban Boston – or, as the southies say ‘Bahstan’. Pretty straight forward formula right? Wrong! That’s where things get interesting. Patrick Kenzie (played by the could-he-be-any-younger-looking) Casey Affleck is out to find a missing child, brought to his attention by the kid’s aunt and uncle. Said aunt and uncle are seemingly much more concerned about getting the kid back, as their actions speak much louder than the mother, played by Amy Ryan who does a stunning job of being the white-trash druggie mother, who – could have easily swindled her kid for a fix. Add the mother’s apathy, the aunt and uncle’s empathy, and the additionally empathy of Police Chief Jack Doyle (Excellent as always Morgan Freeman) and a quick, plot turning movie and it becomes great. What was great about this flick, it kept everything on one track: no distracting side stories, no film wasted. Just when you think you’re being pulled in one direction, you realize its part of the bigger picture. And that’s why this is such a great flick. Plus, everyone seems to have a hidden agenda, except for our man, Casey Affleck. Who does a star performance as well, hell, he’s probably trumping his big brother who’s more content sitting behind the camera – and there’s no complaints from me. Given that lil’ Affleck has starred in a slew of Indy hits, big box office draws like the Ocean’s series, he’s primed for an Oscar nod soon. Setting for Gone Baby Gone is near perfect: Big Affleck paints a picture of a Boston working-class neighbourhood full of neverdowells, up and coming kids, and street drugs: the kinds of imagery brought to the screen can only come from childhood memories, and we’re that much more thankful that he did that faithfully. Every little nook and cranny of Boston brought to us from street level, and every character a savoury one. Take for instance beat cops Remy Bressant and Nick Poole (Ed Harris and John Aston, respectively) – those guys just remind me of the type of suited cop that would rather lounge around all day in a coffee diner. Of course, that’s just me. Deeper and deeper we get, and the more entangled we find ourselves in a world full of cops, drugs, red herrings and the search for justice. I’ll leave it at that. Just be warned, nothing is as it seems and there are always a few twists around the corner, the last one had me questioning my own judgment should the situation ever happen. Thought provoking and fine – you should check it out.